Given the current events surrounding South Park and Scientology, I thought I'd post some pictures while they're topical. 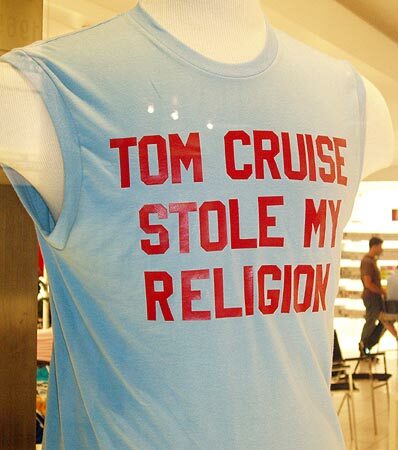 I saw this shirt with the slogan, "Tom Cruise Stole my Religion", in the window of a store near Grauman's Chinese Theatre on Hollywood Blvd. last August. I'm not sure of the exact intended meaning. 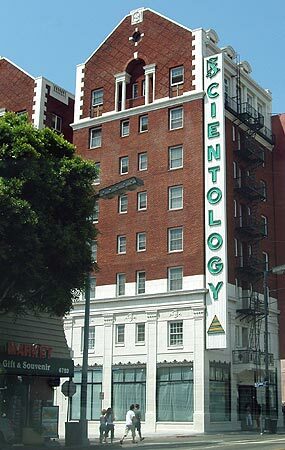 This Scientology Building, also on Hollywood Blvd., was nearby. But, graphically, I don't think the superimposition of the symbols with the "S" really works very well. It would work if the symbols flashed, or if the combo used different colors. As to explaining Scientology, there's a Rolling Stone article that seems fairly well done, here. And here's an interesting account of an anti-scientology protest in LA. Our own fleeting encounters with Scientology occur every year at the Kansas State Fair when they show up with these little polygraph-like devices that are supposed to measure your stress levels - levels which can, so the always-cute Scientology chicks say, be reduced through L. Ron Hubbard's teachings. One year, after I mentioned to one of the Scientolo-babes that I was a trekkie and thought Kirstie Alley had made a hot Vulcan in Star Trek II, she told me I could probably obtain the actress's autograph if I came to their Wichita office. I have, so far, declined.